This Easy Molten Chocolate Lava Cake recipe is made with 6 ingredients in 20 minutes and includes gluten-free options! Check out the step-by-step photos, instructions and video showing how to make the best chocolate lava cakes EVER! 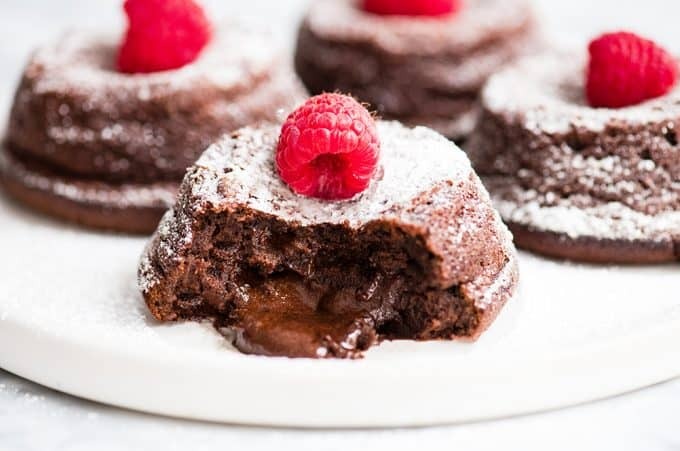 These Molten Chocolate Lava Cakes are a rich, decadent, gourmet dessert that are surprisingly easy and uncomplicated to make! They come together from start to finish in under 20 minutes, and are sure to wow your dinner guests! Seriously, these lava cakes are so simple that I want to make them all the time. 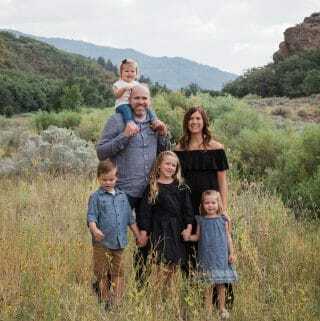 They have been a go-to in my house for almost a decade, and I’m so excited to share them with you today! Once you try to make them at home, you will never need to go out to a fancy restaurant to satisfy your molten chocolate cake craving again! (i.e. Gooey chocolate cake in my pajamas…yes please)! Not only are these beauties simple and special, but they are easily made gluten-free to comply with your (or your guests’) dietary needs! How do you make chocolate lava cake? 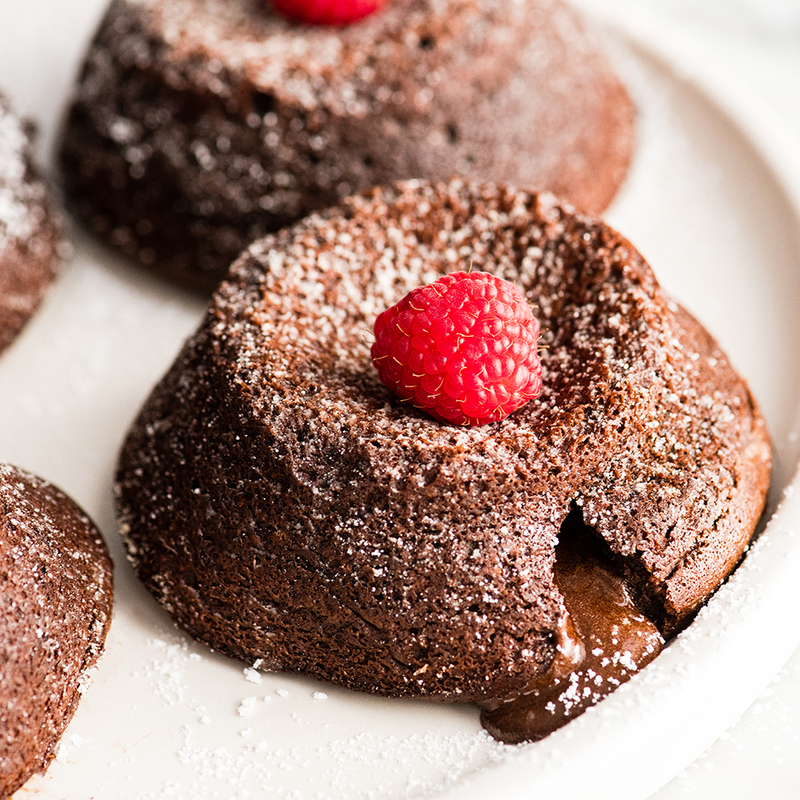 These chocolate lava cakes are super easy to make! But (as always) I want to walk through the steps with you to ensure your success! You can also watch the video in this post to see exactly how they are made! The first thing I like to do is gather all of the materials and ingredients necessary to make this molten lava cake recipe. There are only six ingredients, so this part is a breeze. 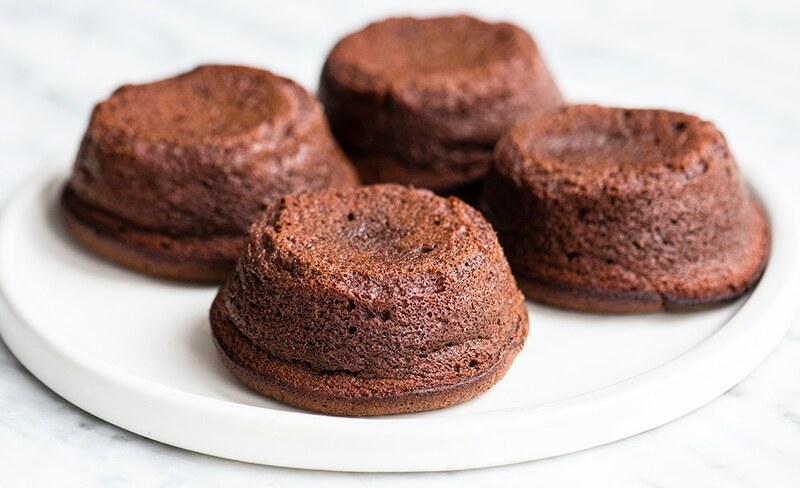 The one “special” item I recommend buying if you are a chocolate lava cake fan and plan on making this recipe over and over again, are these Silicone Mini Cake Pans/Large Muffin Cups or this Large Silicone Muffin Pan! Yes, you can use a regular muffin tin to make this molten chocolate cake, however using these large silicone muffin cups makes removal a total breeze. Since I love serving chocolate lava cake when we have friends over for dinner for a special, elegant dessert, I really care about the presentation! And being able to remove them easily from their baking vessel is key to pretty little molten lava cakes that hold together nicely! In the microwave. 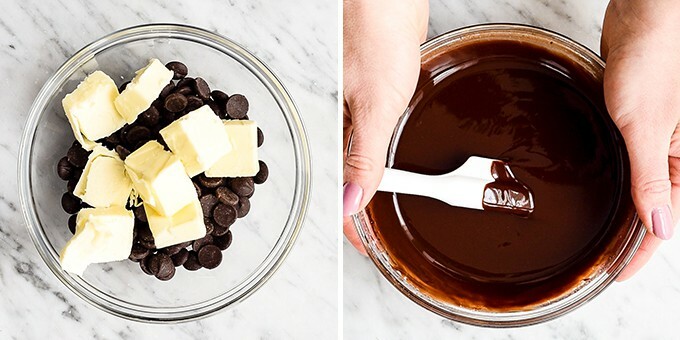 Put the butter & chocolate in a microwave-safe bowl and warm until just melted (about 60-90 seconds). Start by warming for 60 seconds, stirring, and then warming in 30 second increments stirring after each until the mixture is melted and smooth. On the stovetop over medium-low heat. You can also gently melt the butter and chocolate together in a small saucepan on the stovetop over low heat. Be sure to stir consistently and remove the pan from the heat as soon as the mixture is smooth. One the butter/chocolate mixture is silky smooth and fully melted, set it aside to use later in the recipe. 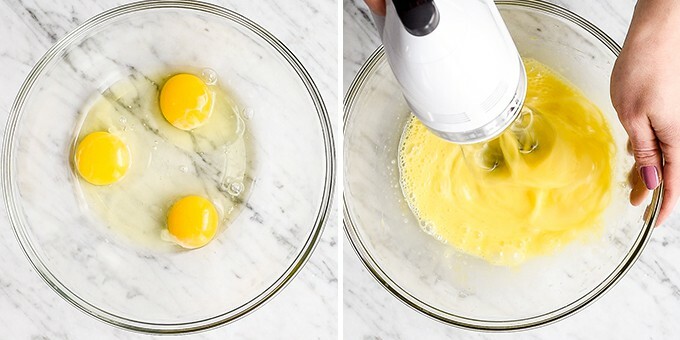 Using either a standing mixer or hand mixer, beat the eggs until they are light and pale (for about 60 seconds). This is an important step for the overall texture and heartiness of this chocolate lava cake recipe, so please don’t skip it! 4. Add sugar & salt and beat again. 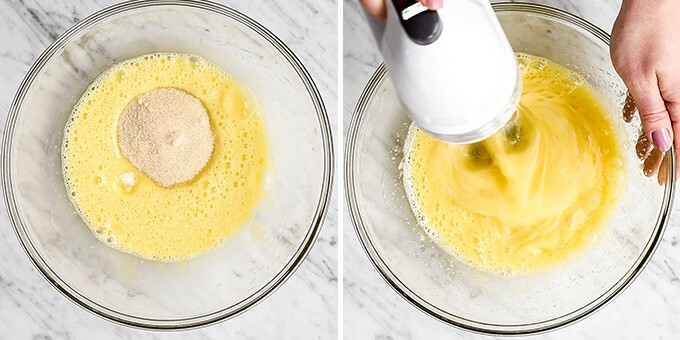 Once the eggs are light and pale, add sugar and salt and beat until the sugar is completely dissolved. I used a hand mixer for the sake of making a video, but I usually use a standing mixer fitted with the wire whisk attachment. 5. 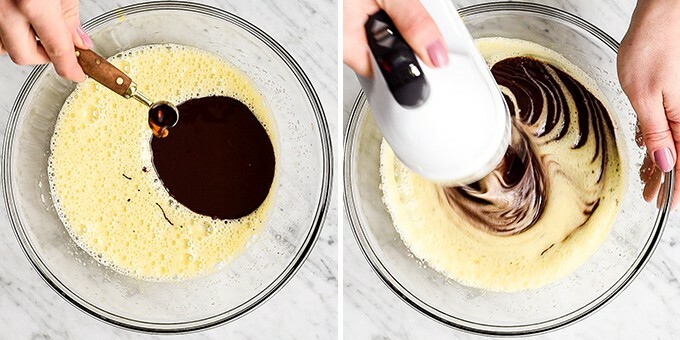 Add melted chocolate & vanilla…and beat again. Do you sense a “beating” theme in this recipe? By this point the melted chocolate should have cooled slightly, and is ready to be added to the molten lava cake batter (along with the vanilla). Beat until the mixture is homogenous (uniform throughout) and smooth. 6. Add flour and mix until just combined. Last, but not least, add the flour of your choice (see notes on what types I recommend later on in the post or in the recipe card). This time, mix the batter on low speed until the flour is just combined. The final batter will be thick with a rich chocolate color (pictured below). YES! 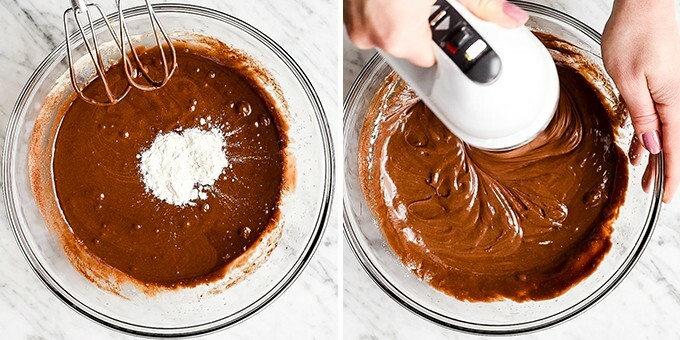 You can make this chocolate lava cake batter up to one day ahead of time. Simply return it to room temperature an hour before baking and then bake as the recipe directs. I will often prepare these before dinner guests arrive, and then pop them in the oven when we’re halfway through the meal so that I can serve them fresh and warm. I recommend storing the batter in the refrigerator if you plan on waiting more than one hour after it has been made to bake! Place the silicone baking cups or silicone muffin pan on a flat baking sheet. Use a 1/2 cup measuring cup to scoop the batter evenly into the baking cups or the wells of a muffin tin. These are large baking cups (3 1/2″), so the recipe yields four chocolate lava cakes which take roughly 10-12 minutes to bake. If using a smaller baking vessel, be sure to adjust the baking time accordingly. I have made smaller molten lava cakes & this recipe has yielded 6, however if you do that baking time will be between 8-9 minutes. You will know the molten chocolate lava cake is done when the top is puffed but doesn’t look totally set. It will still be jiggly which is a good thing. If the top becomes too set it will mean that the inside is set as well, and you will not have any gooey lava ooze out and it will be a sad day! Whomp Whomp. 8. Let the chocolate lava cake cool slightly. Let the molten lava cake cool for 2-3 minutes in the baking cups before removing. This will ensure that the cakes hold up when transferred. The tops will sink a little bit as they cool, which is completely normal. 9. Turn chocolate lava cakes out onto serving plates. Carefully turn each chocolate lava cake out onto a serving plate, and gently remove the silicone cup from over the top of it. I recommend putting the molten lava cake directly onto the plate that it will be eaten from. They are not easy to move once they have been plated, and you run the risk of them falling apart in the process if you transfer them twice. Do lava cakes need to be served warm? Yes and amen. They absolutely do. If you want that gooey, oozy, chocolate lava-y factor they should be served no more than 5 minutes after being removed from the oven (and I recommend more like 3 minutes). Here are answers to a few frequently asked questions about making chocolate lava cake! The only thing inside a chocolate lava cake is the batter! Baking molten chocolate cakes at a very high temperature (450 degrees F), causes the outside to bake faster than the inside. This leaves you with a perfectly cooked shell loaded with gooey, to-die-for, chocolate lava filling! If you have leftover chocolate lava cake I recommend storing it in the refrigerator in an airtight container. Doing so will preserve their freshness longer! YES! I have reheated my fair share of lava cakes with beautiful results. 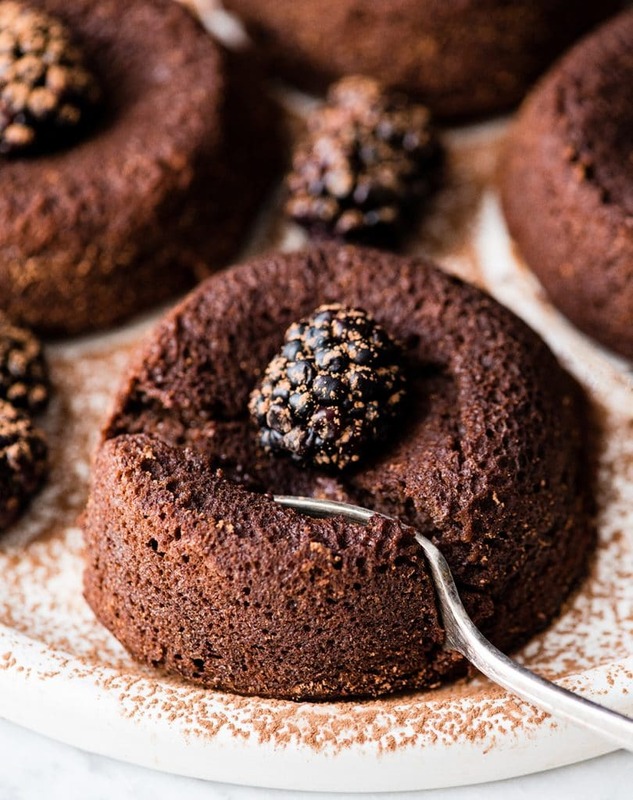 Simply warm the chocolate lava cake in the microwave for about 30 seconds and enjoy! 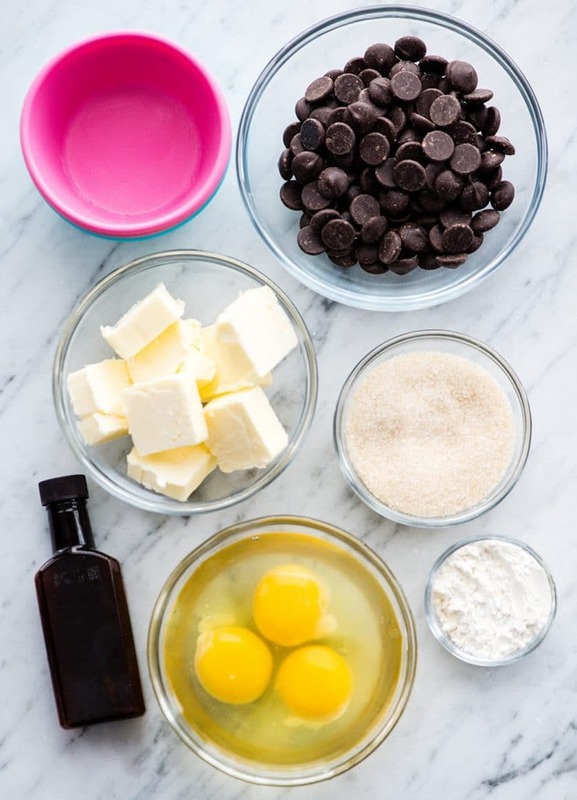 Let’s take a minute and chat about the ingredients in this molten lava cake recipe, and possible substitutions. Salted Butter. I always bake with salted butter. However I’m sure unsalted butter would work equally as well, you may just need to increase the amount of salt in the batter to 1/4 tsp (and a simple taste test should tell you that). In theory you could use vegan butter for a dairy-free version, but I have not tried it and cannot guarantee the results! (If you do try it please let me know in the comments). Semisweet Chocolate. Please NOTE: The quality of chocolate that you use in this chocolate lava cake recipe really matters. My go-to chocolate variety is Ghirardelli 60% dark chocolate chips. They are my favorite because I love the taste, quality and darkness. You can use chocolate chips or a chopped chocolate bar, just be sure to use 6 oz (or 3/4 cup) in total before melting. Eggs. 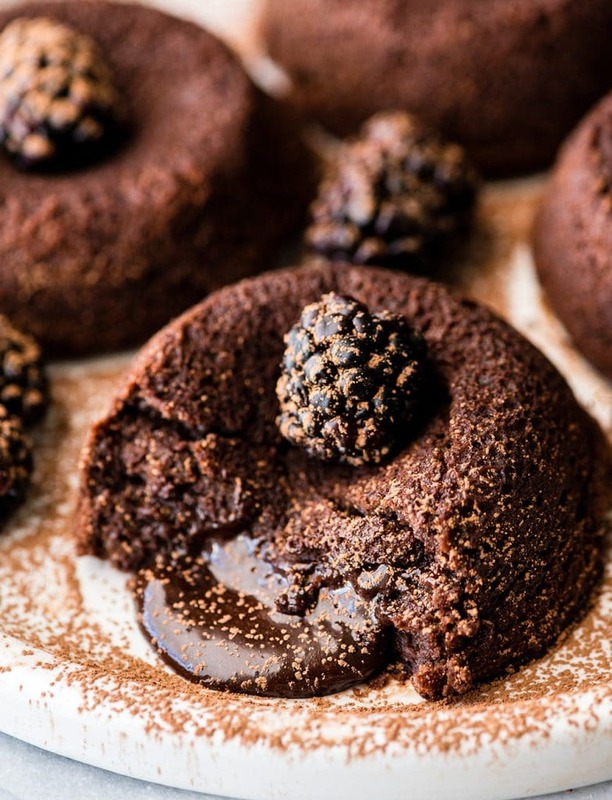 There is no substitution for the eggs in this chocolate lava cake recipe. I recommend using room temperature eggs for the best results! Granulated Sugar. I use organic cane sugar in all of my dessert baking, however you can use regular white sugar as well. Vanilla Extract. Please be sure to use pure vanilla extract (not imitation or vanilla-flavored extracts). You can also use vanilla bean paste if desired! 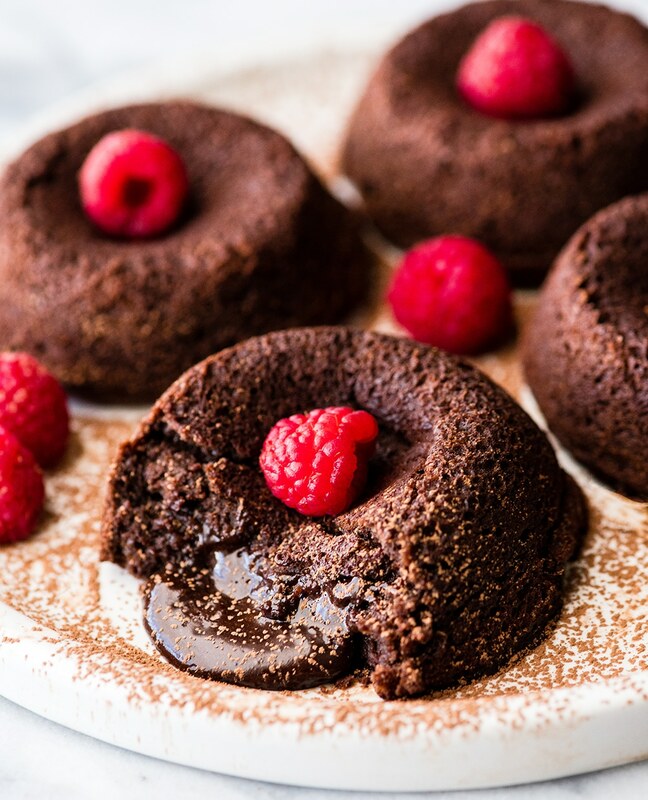 This Easy Molten Chocolate Lava Cake recipe is made with 6 ingredients in 20 minutes and includes gluten-free options! Check out the step-by-step photos, instructions and video showing how to make the best lava cakes EVER! *I have used all-purpose flour, almond flour, and gluten-free all purpose flour with excellent results in this recipe. 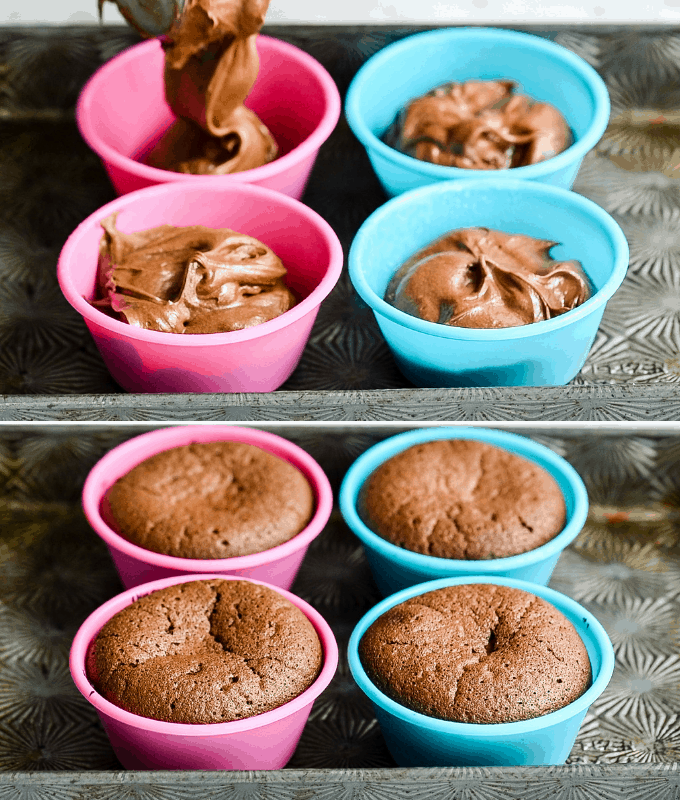 **You can use a standard muffin tin that is greased very well, however silicone cups are by far the easiest way to ensure that these molten lava cakes are removed in-tact. ***To prepare in advance: The batter can be made up to one day ahead of time. Simply return it to room temperature an hour before baking and then bake as the recipe directs. I often will prepare these before dinner guests arrive, and then pop them in the oven when we’re halfway through the meal so that I can serve them fresh and warm. I’ve never made molten chocolate lava cakes!!! The pool of chocolate pouring out of the middle is just so exciting to me. our batter is much more runny than your photo. I have checked all the numbers carefully! Was your batter cooled a bit ahead of time for the butter to harden a little? Hey Laura! YES the batter thickens as it sits! I have baked these cakes both immediately after mixing and have waited hours and they always turn out great! The batter should be a touch thick after beating the eggs/sugar mixture! How did it end up working for you?